Our natural river rocks and river stones are engraved to be personalized and attractive. 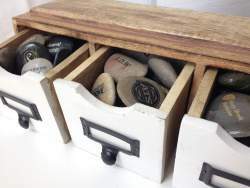 Whether they are carried in the pockets of those who receive them or placed in a meaningful spot, these rocks are lasting mementos that can do everything from inspire hope to advertise a brand. You may choose from a variety of colors, sizes and finishes. We sell in bulk quantities that are competitive with wholesale prices—the more you buy, the more you save! Placing your order is always simple and we provide you with reliable estimates on production time, making it easy for you to share a sentiment or give an award. Please contact us with any questions as you get started!